Almost a year ago while visiting my good friend and long-time assistant, Emily Bell, in Columbus, Ohio, I fell hard for a delicious soup she served me. On a cold November night, she sat a shallow bowl in front of me with a mound of brown rice in the middle and a beautiful rust-hued broth with chopped greens and beans ladled over it. A basket of cornbread set near by. One spoonful and I was begging for the recipe. I couldn’t put my finger on all the flavors, so my host willingly shared the recipe. She had sautéed diced smoked sausage along with onions, carrots, and celery. Next, diced potatoes and minced garlic were added to the soup pot and finally the big flavor makers—chopped collards and kale plus black-eyed peas and field peas. Chicken broth and a can of tomatoes with their juices were the braising liquids for this mélange, which needed to simmer for 30 to 40 minutes. 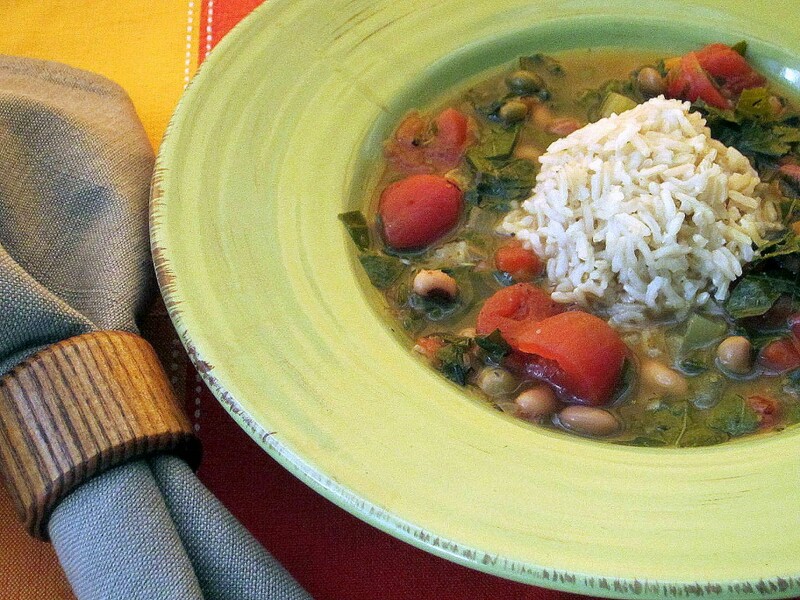 This entry was posted in Food News and tagged black-eyed peas, brown rice, collard greens, kale, soup by brosbottom. Bookmark the permalink. Is there an actual recipe? Yes, hit the “2” at the end of the text and it will take you to the second page where you’ll find the recipe. Hope you’ll enjoy it! My husband is excited by the soup recipe and more so that it came from his home town, Columbus OH! Thanks for another great recipe! Didn’t realize he was from Columbus! Let me know how you like the soup–I’ve got a whole pot of it in my fridge for the weekend! If I wanted to make this a meat free soup – how else can I add the depth and smoky flavor that comes from the smoked ham? That’s a great question. Nothing will quite replace that nice smoky flavor of good ham. However, you can leave it out and, I might try adding just a hint of smoked paprika (use the sweet, not the hot spicy variety). Add very gradually starting with an 1/8th of a teaspoon and tasting it before adding more. I hope this helps. Let me know how it turns out if you try it. Hi – looking forward to making this soup for my mom who is in rehab (in Columbus, OH) and hating the food. Years ago when I was in school at OSU between (71-75) there was a boy, named Phillip, I think, who attended the Indianola Preschool (Ithink). His last name was Rosbottom and wasn’t sure if you were connected but he is the only child I remember from undergrad and remember him calling me “Phillips” ! Anyway, he was a delight. I hope your mom will enjoy this soup–it’s really comforting. Our son’s name is Michael so that might be the youngster you’re thinking of from way back then. We came to Cols in 73! I love your cookbooks. Went to your cooking school at Lazarus in Columbus many times. Thank you so much for your kind note. 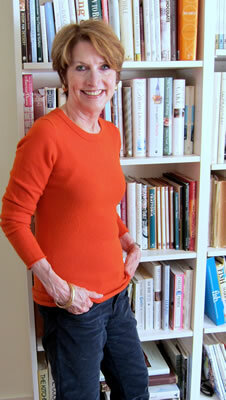 So glad you like my books and hope you have a chance to see my newest, Sunday Casseroles, which just came out! I used to read you in the Columbus Dispatch and was sorry when you were gone. I found a recipe for an artichoke bruschetta that my husband and I enjoy often. So glad that you are continuing to use the recipes that appeared in the Dispatch when I wrote for the paper!